I don't see the files in the CloudStation when accessing from the web browser. - Details of an answer | Buffalo Inc. I don't see the files in the CloudStation when accessing from the web browser. At first, check the power LED in front of the product. Make sure that the power switch is set "ON" position. If the power switch is "OFF", switch it to "ON" position. 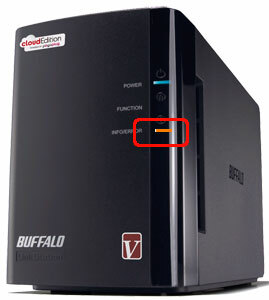 If the power switch is "ON" or "AUTO" position, make sure if the disk error is occur. The unit may be in the Sleep mode. Awake it from the Sleep mode. Occur Check the error information and fix the error. Check if I53 does not show up. Make sure that INFO/ERROR LED is flashing AMBER. If the I53 information is showed, the CloudStation is not communicated with the cloud server. Make sure your device is listed in "Your Pogoplug enable device". Log in to the remote Web interface. Click [Setting] at the top of the screen. Navigate to [Account setting]-[General Setting]. Reason 1: The e-mail address is not conncted with the CloudStation. Try logging in to the CloudStation again with your registered e-mail address and password. Reason 2: The device which is activated is not in the network. Please try activation for your new device.